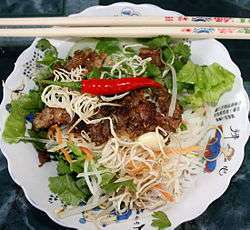 Bún thịt nướng (literally means "rice noodles [with] grilled meat") is a popular Vietnamese cold rice vermicelli noodle dish topped with grilled pork, fresh herbs like basil and mint, fresh salad and bean sprouts, and chả giò (spring rolls). The dish is dressed in fish sauce (nước chấm). Also, the dish is topped with roasted peanuts, Vietnamese pickled carrots, nem nướng̣ [grilled garlic pork sausage] or grilled prawns. Bún thịt nướng is popular in all regions of Vietnam, except for in Hanoi, where a related dish bún chả is served.